For centuries, battlefield heroism has been acknowledged with medals for bravery. In the automotive racing world, national championships offer trophies to set on the shelf as testimony to the team’s efforts. Engine builders are also acknowledged, but details of their achievements are usually shrouded in secrecy. However, Dan Jesel has decided to allow us an unprecedented look inside his innovative new V8 race engine. Dan Jesel’s valvetrain company – Jesel Valvetrain, if you haven’t made the connection yet – is marking its 40th year in business and what better way to celebrate that achievement than to build an engine that transcends the compromises that have plagued production-based pushrod engine builders for decades. Jesel decided to assemble all of the lessons gleaned over a half-century of engine building and valvetrain experience into something more tangible than a mere trophy. 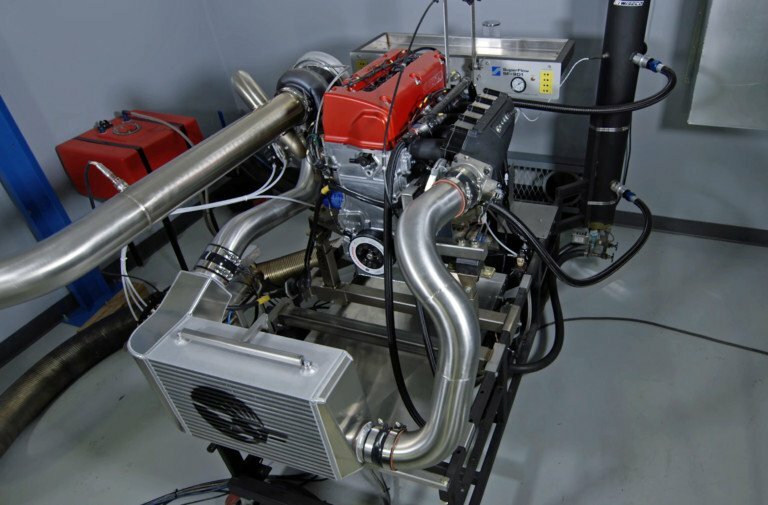 After helping Mike Moran design and build his all-billet 673ci twin-turbocharged engine, the effort inspired Jesel to build his own high-RPM race engine. There’s a lot going on here. The block has an 8.50-inch deck height with 4.50-inch bores and a 5.00-inch bore center. The large 3.50-inch camshaft tunnel accommodates the oversized journals necessary to mount the cam in the block. The entire block is O-ringed for ease of maintenance, with the exception of the deck (which uses Cometic head gaskets). Also, note the six bolts in the front main journal that mount the ATI damper. He calls his engine the Jesel Equal 8. Designing an engine from a clean sheet of paper is fraught with peril. Making a decision early on that leads to a dead-end is costly on multiple levels. However, the reward is the opportunity to fabricate the engine your way. 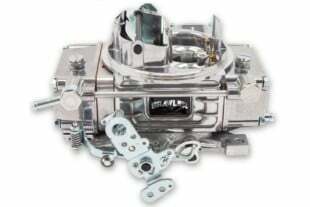 The engine is named not just for the valvetrain innovations, but also because Jesel has equalized the induction side as well. Peer through the tunnel ram with a carburetor removed and it’s nearly a straight shot to the back side of the intake valve for all eight intake ports. That straight line is the pure and simple path to symmetry-based horsepower. 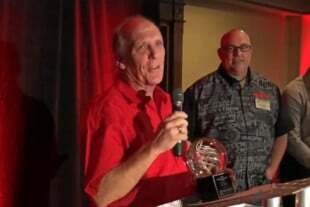 For those who may not be acquainted with Dan Jesel, he grew the company that bears his name out of a small competition machine service shop where he built mainly drag race engines. 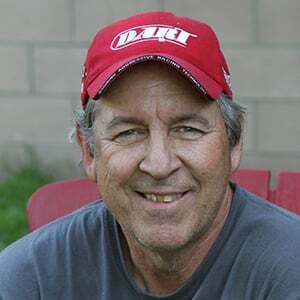 Jesel Valvetrain Innovation soon followed and he was the first to design and build successful racing aftermarket shaft rocker systems that today span competition engines from NHRA Top Fuel and Pro Stock, to NASCAR and Le Mans. Among his more recent innovations is the wheel-guided, cartridge lifter as used in the Equal 8. That’s a billet steel 3.350-inch stroke Winberg crankshaft with 2.500-inch main journals and 1.850-inch “Indy” rod journals to minimize bearing speed. The larger main journal improves strength. 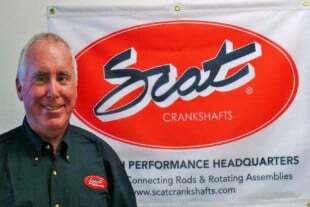 The crank’s counterweight design and position enhances performance at serious RPM while minimizing harmonics. The pan rail clearance is 11 inches measured inside to inside. For comparison, a big-block Chevy spans only 8.5 inches. Jesel is quick to point out that he did not design this engine alone. Many people have been involved in the process, but two standouts include his collaboration with Tom Slawko, owner of Slawko Racing Heads in Morgantown, Pennsylvania, and billet CNC block magician Charlie Weston, whose numerical machines reside in Piscataway, New Jersey. Jesel says the Equal 8 could not have happened without their expertise, encouragement, and willingness to attempt this unique adventure. What makes this story even more interesting is that the Equal 8 has yet to turn a piston in anger. What you see here is perhaps the 90-percent mark. There are multiple riddles still to be solved, yet Jesel decided to debut the near-complete engine at the Performance Racing Industry (PRI) Show in Indianapolis in December of 2018. Right now there are only two blocks and two sets of heads in existence. The large diameter tool steel cam core (left) generates minimal twist and bending moments from high spring pressures. The clamshell cam bearings bolt around each journal and the entire assembly is installed in the block. (Right) The cam is driven by a Jesel 21mm-wide carbon belt tensioned by an adjustable idler pulley. This story will offer as many interesting snippets of information as we can cram into this short space. This first foray is constructed around a normally aspirated 16:1 effort, to be used in the thin salt air of Utah at Bonneville. Jesel chose the 427ci displacement as much for nostalgic reasons as any other. Internal combustion futurists may scoff at pushrods, carburetors, and distributors as vestiges of a steampunk-like era. That might be true from a 21st Century, Mars Rover perspective. But for the legions of internal combustion true believers, Jesel’s Equal 8 is pure jewelry. The 427 was also selected to provide a direct comparison to well-known, same-displacement platforms including Chevy’s L88, the 426 Mopar Hemi, the 429 Shotgun Ford and of course the current LS7. The first thing everybody wants to know is – “how much power will it make?” The simple horsepower equation dictates that with the same torque, the faster you can spin an engine, the more horsepower it can make. This is far more difficult to execute than it may appear, but Jesel has been fighting valvetrain discord for decades. The Equal 8 is his shot at making it right. To that end, the goal shoots way past 10,000 rpm. Months of Spintron effort underscores that his design is stable to 12,000-plus rpm and he’s aiming at 1,325 horsepower. That is just a mere 3.1 horsepower-per-cubic-inch. Naturally aspirated, mind you. The Straight Column Valvetrain (SCVT) features pushrods with less than 1-degree of angularity out of the lifter bore, positioning the pushrods to intersect the rocker shafts at 90 degrees. This layout might look different because it is. The raised cam location dictates the approach angle to the rockers which are positioned on the head for ideal roller sweep across the valve tip through the full range of lift. That four-digit horsepower number might sound fanciful, but let’s look at the math. With 16:1 compression, it’s almost conservative to estimate this engine could make 1.55 lb-ft of torque per cubic inch. Let’s plug this into simple math formula we picked up from our friend Ben Strader at EFI University. Start by multiplying 1.55 lb-ft/ci by engine displacement: 1.55 * 427 = 662 lb-ft. This is peak torque. Strader says race engines typically lose 12-percent of torque between peak torque and peak horsepower. So multiply 0.88 * 662 = 582 lb-ft – this is torque at peak horsepower. Now we simply plug these numbers into the horsepower equation: HP = (Torque * RPM) / 5252 which becomes (582 x 12,000) / 5252 = 1,329 hp. That’s almost exactly Jesel’s estimate. The Equal 8 integrates Jesel’s latest cartridge lifter which is a wheel-guided lifter, using a 1.00-inch lifer body with a 1.220-inch roller wheel that’s 0.250-inch wide. The lifter wheel encapsulates roller bearings that are the only bearing capable of handling the severe inertial loads that occur at extreme engine speeds. These particular Jesel lifters use needle bearings, not bushings, and are the same as used in applications from NHRA Super Stock to Top Fuel. But that’s enough theory. Common sense dictates a big-bore and short stroke. The first decision pondered how far apart to space the bores – landing on 5.00-inch bore centers which are 0.160-inch wider than a big-block Chevy. The big bores allow a larger intake valve while the short stroke reduces piston velocity and friction at ionospheric engine speeds. A short stroke also allows reducing the deck height to 8.500 inches (a small-block Chevy is over a half-inch taller at 9.025-inches). Also of note is that the cam tunnel is radically higher in the block to shorten the pushrods to 7.50 inches. 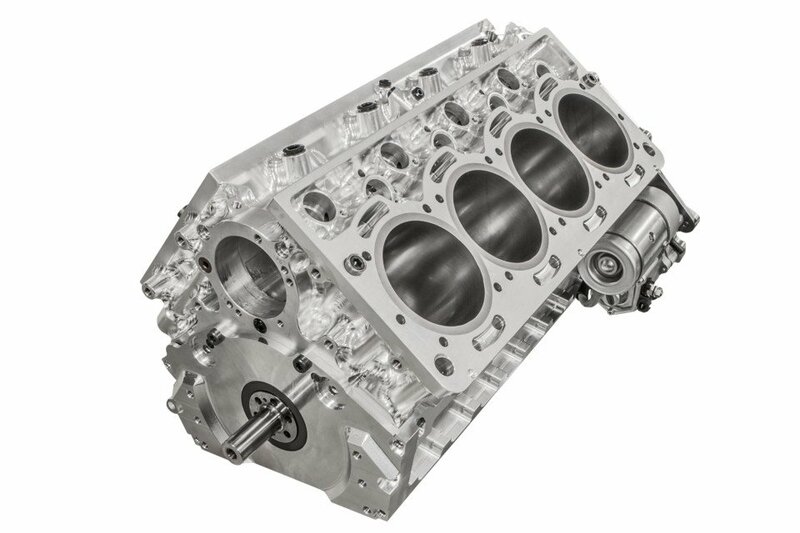 Jesel’s experience in valvetrain science is well documented, so it is not surprising that this would be a pushrod, 2-valve per cylinder engine. From this vantage point, it would be shocking if the pushrod angles are anything other than within a degree of perpendicular to the cam at maximum load. The remainder of the system is also optimized. So much so that Jesel labeled the configuration SCVT which stands for Straight Column Valve Train. But this goes way beyond just optimizing the rockers. The cavernous 3.50-inch diameter cam tunnel seems out of proportion to the rest of the engine, at first. In a way, it is, since it scribes a wider arc than the crankshaft stroke! But it’s all part of the design. The tunnel accommodates an almost equally hefty tool steel camshaft while accepting four, two-piece, clamshell cam bearing journals, supporting the three bearings included with the drive and rear mounted pump. Another innovation is this copper valve spring seat that pulls heat from the valvespring and threads into the head to allow easy changes to installed height. Once positioned, they are locked in place with screws. Notice how tight the clearance is between the head bolt stud and the pushrod. The cam bearing journals allow Jesel to use a huge diameter cam core. A larger cam core offers room to create a larger base circle which is more stable. Plus, the oversized base circle improves the pressure angle exerted on the lifter body, enhancing durability. However, Jesel determined that he needed both lobe lift and rocker ratio to make his planned power. So the Equal 8 sports a 1.95:1 intake and 1.85:1 exhaust rocker ratio, on their way to net (after lash) valve lift numbers of 1.080 inches for the intake and right at 1.00 inch for the exhaust. These numbers work with 0.050-inch camshaft duration numbers of 278 degrees for the intake and 300 for the exhaust. The large, two-piece, clamshell cam bearings are doubly beneficial for another reason. Production V8 engines align the cam journals with the main webs mainly out of convenience. Jesel bypassed that limitation by placing the lifters where they needed to be to perfectly align with the rockers and valves. Then he filled in the gaps with the bearing journals. Jesel placed the intake lifter bores at 43 degrees and the exhaust at 59 degrees. You could think of this as a top-down approach, building the engine around the valvetrain as opposed to focusing first on the rotating assembly. While a distributor may seem anachronistic, Jesel included it in the design. However, the engine is designed to also run with electronic ignition control. The lifters are 1.00-inches in diameter for a reason. Jesel recently introduced his cartridge lifter as the latest innovation to enhance valvetrain stability. The cartridge that surrounds the lifter is threaded for height-adjustability and is bolted to the lifter valley for easy service. The lifters encapsulate an even larger 1.220-inch x 0.250-inch-wide roller wheel. The roller wheel also acts as a guide to ensure the lifter remains aligned, following twin slots machined into the cartridge body. This eliminates the excess baggage of tie-bars that are both heavy and induce friction. Experience also demanded that Jesel design the lifter bore with sufficient length to prevent the lifter from protruding out of the bottom of its bore when on the base circle. No oil pan compromises are necessary with the Jesel-designed Dual Drop Gear starter assembly that is adjustable for use with the Boninfante flywheel. 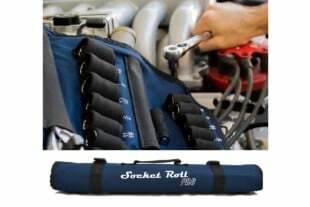 The “kick-out gear” starter drive is designed to place the starter motor away from the pan rail. As mentioned, Tom Slawko created the symmetrical-port billet aluminum heads. There seems to be a direct correlation between near-vertical valve angles and power, and Slawko’s intake valve is certainly pointed in that direction. The Intake sits at 9 degrees off of vertical with a pitch of 3 degrees, angling it toward the center of the bore which improves flow by moving the valve away from the cylinder wall. The exhaust is even more upright with a 2-degree angle tilted 1.5 degrees. The Victory titanium valves measure 2.400-inch on the intake side and 1.700-inch on the exhaust, residing in 42cc combustion chambers. All the rocker shafts are designed so that they can remain in place when the head is removed, making the engine much easier to disassemble for service. Slawko put the intake valve seat angles at 55 degrees to complement the 1.00-inch lift capability of the heads. The valve sizes are 2.400 and 1.700 and the flow through each valve is engineered to be awesome. The chamber volume is a tight 42cc’s to push compression and improve combustion efficiency. The photo on the left also shows the Cometic MLS head gasket. On the right, this deck view with one piston in place indicates the layout of the intake and exhaust valves. Notice how far the valve pocket is from the bore. Slawko says Jesel gave him essentially a blank sheet of paper with the bore spacing specs and requested a head that would make the horsepower numbers naturally aspirated. With his experience building heads for Bob Book’s Australian Pro Stock Chrysler P5 applications, he used that as a staging point to create the high-flow head for the Jesel Equal 8. Slawko said that one of his biggest challenges was heat mitigation. “We tried to put as much cooling into this as possible since he was going to run this at Bonneville,” says Slawko. The coolant comes up from the block and intersects inside the head with passages surrounding the exhaust side of the chamber. “That’s where most of the heat is,” Slawko explains. “We cross-drilled the heads at a 45-degree angle so there would be no trapped air pockets in the heads.” The coolant exits the head into an external manifold that is plumbed to the radiator. Jesel even redesigned his AN fittings to radically increase their I.D. to improve flow from the same size tubing and changed the thread pitch to create half-turn sealing. This fitting attaches to an external log manifold that directs coolant to the block, around the sleeves, and then out through the heads. Flow bench numbers are a popular way of comparing cylinder head potential. However, flow numbers can also be misleading. Nevertheless, at 28 inches test depression, it’s estimated these Slawko intake ports could exceed 480 cfm with the exhaust at nearly 300 cfm. This airflow is matched by an equally impressive fabricated aluminum sheet-metal intake from Keith Wilson at Wilson Manifolds, mounting a pair of Book Racing Engine (BRE) billet aluminum Dominator carburetors. What you might have noticed is that the Wilson intake is also fitted with fixtures and fuel rails for an EFI effort; so it’s clear Jesel will be experimenting with both forms of mixing fuel and air. This top view of the block shows how the coolant moves between the block and the heads through the slots opened in the block. This shot also illustrates the large diameter holes for the Jesel cartridge lifters. There’s also an up-front distributor driven off the oil pump, which is gear driven off the camshaft instead of using a belt off the front of the engine. Jesel tells us he configured the engine to be able to run either a digital ignition with the distributor and carburetors or a complete sequential EFI and coil-near-plug ignition. Jesel plans to begin testing this engine sometime in the spring of 2019, at which time we will update the engine’s progress and share the power numbers. A 12,000-plus rpm Bonneville blast is more like an endurance test compared to a five-second drag race pass, but it’s all Jesel’s experience in valvetrain design that places this effort snugly under the “achievable” category. It also helps that your name is Dan Jesel. That’s Dan Jesel at the PRI show moments after JE Pistons awarded his Equal 8 engine with the Masters of Motors top prize “Engine-uity” billet aluminum trophy seen in the background.